This quarter, instead of playing volleyball or vaulting over the pommel horse in gym, my daughter learned how to build a bivy sack and a debris hut to attach it to. She also learned how to start a fire by directing sparks onto a shredded cotton ball seasoned with magnesium bits. The survival course is an alternative to the traditional gym class at Arlington High. The course ends with a four-day, three-night, solo outing in a state forest. The kids are given six “strike anywhere” matches and a ten by ten tarp. The list of things they are responsible for bringing include a roll of string, a knife, a flint, a metal trowel, a pot, a few cotton balls, and yes, a roll of toilet paper. The school provides a few other key things as well; a sleeping bag rated for some ridiculously cold temperature, a pair of army surplus boots that are guaranteed to keep their feet warm (unless they wear too many socks or tie them too tight), and enough food to keep them from starving, to wit; a block of cheese, a stick of pepperoni, a couple of bagels, some oatmeal, and a package of mac and cheese. Can’t start your fire to heat water? Kids have been known to chomp on uncooked pasta. The teacher of this class, Bob Tremblay, told a room of concerned parents that Arlington High has been offering this course for forty years and he’s been leading it for nine. Bob looks like my idea of an outdoor guy, with shoulder-length hair and a full, grey beard. Given the variety of kids going on this trip, it may be time for me to reassess what an “outdoor” person looks like, but I can tell you what they don’t look like – me. When Hannah first said she wanted to do this, I said, “Are you out of your freaking mind?” My response probably caused her to rocket straight from interested to determined. If I had shrugged and said, “Whatever,” maybe she’d be home with us now, warm and well-fed. But shocked as I was, I was also inordinately proud, even though this was clear proof that kids are hard-wired for things parents can’t take responsibility for, good or bad. 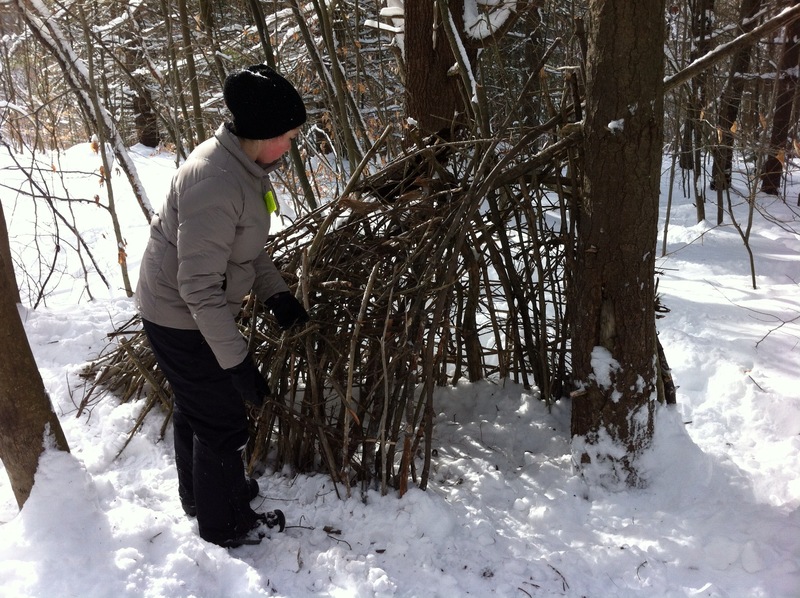 We spent the weekend in Vermont before her trip so she could practice building fires and huts. As you can see, she seemed to get the hang of it. On the official outing, the kids are separated from each other. Each one is given roughly two acres of their own and confined to their area for the duration. If you sneak off to meet a friend and they catch you, you fail the course. One of the things Bob likes about those heavy army boots is that they slow the kids down, make it hard for them to cover too much ground. By the time you read this, she will have been returned home, hopefully safe and sound. Strangely, I was relatively relaxed while she was gone. I did worry briefly each night that she’d be bored and cold, and during the day I was grateful that it wasn’t unbearably cold. Now, though, as her return becomes imminent, I am getting more anxious. Maybe that’s because I’m finally allowing myself to think about her, rather than actively working to distract myself. No matter the reason, I’m sure that when I see her and express my joy and relief at having her back, she’ll respond with her usual aplomb, “What? It was no big deal.” But we know the truth. It was a very big deal. This entry was posted in Uncategorized and tagged bivy sack, debris hut, high school trip, Survival. Bookmark the permalink. I sure hope there is a follow-up post to this. I want to know what happened to her! You and me both! She’s not home yet. This is why I think Scouting is important. You at least learn that if for some reason you’re lost somewhere, if you use a bit of knowledge you can increase your chances of survival dramatically. And, when the apocalypse comes, she’ll be able to take care of her old lady! We’re definitely eager to hear a full report. I would be inclined to think that boredom would be the biggest problem. I know you were there and everything, but are you absolutely certain that this is the child who emerged from your womb? I’m not the first to mention this, but I do hope there is a followup report in the works. Great write-up, Judy, I’m going to share it. My son just came home from this splendid endeavor, smelling like woodsmoke and eating up most of the pantry and looking at least a couple of inches taller. I am exceedingly proud of all of them. And thank you Mr Trembley and crew! Thanks! My daughter had a great time. And her stories were priceless. Apparently someone took a picture of her debris hut. I can’t wait to see it! Two of my kids did the trip way back when. My son emerged unscathed and said it was one of the best experiences of his life. My daughter emerged with seriously frostbitten feet (grrr), and still says it was one of the best experiences of her life. (It rained, it got cold, she didn’t have a fire the whole time and-yes-she ate uncooked ramen noodles.) As for her feet -they still turn blue easily. The program leader heard from me loudly and clearly about this, and hopefully works to prevent this from ever happening to another camper. All in all the survival experience is valuable and good. Oh gosh. I think we heard about your daughter at the parents’ night. I’m so sorry she suffered. Frostbite was my biggest fear, because *I* get cold so easily! Fortunately, my daughter arrived home unscathed, and happy as a clam. Judy, I didn’t know you had a blog! Loved this post, and glad Hannah made it home safe and sound. Hope old PTO chums get an advanced copy of your YA book. Hello! If I ever manage to sell a book, I’ll be thrilled to get you a copy. If you like my blog, please tell your friends and subscribe so it can come directly to your inbox every week! I do love an audience. I am a subscriber, so count me in your minyan. What a brave kid! I would think she would be scared in the middle of the night all alone. She’s got moxie, you must be very proud!